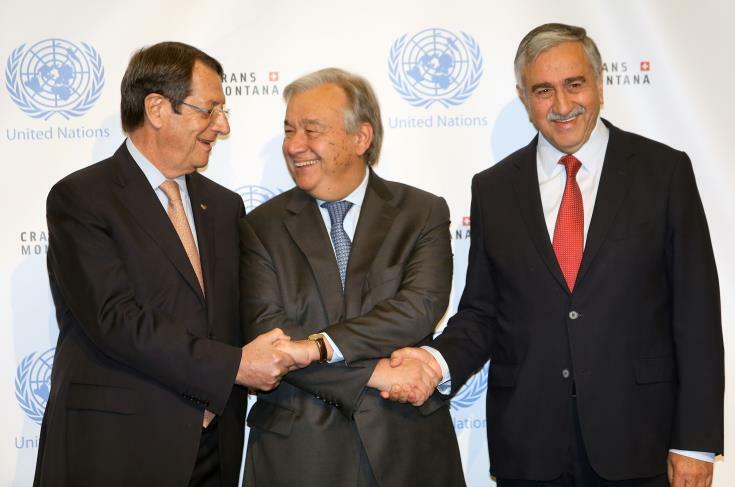 UN Secretary-General Antonio Guterres said that slow progress has been observed in the Conference of Cyprus that has been underway since the 28th of June in the Swiss resort of Crans-Montana. Guterres chaired Friday’s Conference that is focusing on the issue of Security and Guarantees, considered as a chapter “of crucial importance for a comprehensive solution” to the Cyprus problem, as he said. Earlier, Greece’s Foreign Minister Nikos Kotzias welcomed the presence of Guterres at the talks. “The presence of the UN Secretary-General was very useful and beneficial, it put things in order,” said Kotzias as he emerged from a meeting chaired by Guterres. “We discussed the ways in which we can deal with the individual key problems, which refer to the two conditions of security and guarantees,” Kotzias added, noting that the goal has always been to make Cyprus a normal country, like any other UN member-state. A key point of dispute at the talks is the issue of security and guarantees on the island and the presence of thousands of Turkish troops who have been there since the Turkish invasion of the island in 1974. On Thursday Turkish Foreign Minister Mevlut Cavusoglu denied reports of a possible withdrawal of troops.